Scientists have long struggled with how to measure the effects of climate change on wildlife. This is especially true for birds flying in and out of coastal areas bordering the Arctic Ocean. In the past, researchers depended mainly on information gathered by satellite to follow the movement of birds and animals. But this method can be costly and result in huge amounts of information, which can be difficult to process. Now scientists are turning to another kind of technology to help them follow birds and other wildlife. Songbirds are especially difficult to study in the wild. They can fly across thousands of kilometers and their bodies are too small for electronic tracking devices. A new report tells about a project in which researchers recorded songbirds and then put the sounds into a computer program to be studied. The researchers created machine learning algorithms with the ability to focus on bird calls while ignoring other noises. The algorithm helps improve the likelihood of predicting the correct result. Similar machine learning methods have been used to recognize human speech. Birds are known to make more singing and calling noises after arriving in areas where they plan to mate. Spring is short in extreme northern areas of the American state of Alaska. There, the birds must mate and have their young before winter. The algorithm is designed to use the recordings to estimate when the birds arrive in large groups to begin mating. A lead researcher on the project is Ruth Oliver from Columbia University in New York. Oliver told VOA that she and others traveled to northern Alaska to put recording equipment in four different places. The equipment was used to make four half-hour recordings each day. This produced more than 1,200 hours of audio, but not all of it was from birds. Oliver adds that the machine learning method is a valuable tool to help identify and process the most useful parts of the recordings. While some results were produced completely by machine, Oliver said human supervision helped to improve the process. In both cases, the researchers reported the computer was correct in estimating when the birds arrived to their breeding grounds. Oliver says the unsupervised machine learning method could be retooled to use sounds to measure the movements of other wildlife. “This could allow us to track large-scale changes in how animals are responding to climate change,” she said. Emily Jo Williams is a bird expert with the American Bird Conservancy, a non-profit group. She told VOA she agrees that machine learning can provide scientists with valuable information about how climate changes are affecting animal populations. “We know from some research that some birds' ranges have actually changed, and they've moved in response to what we think is a warming climate." 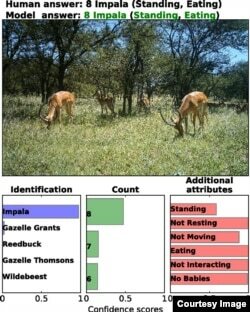 In another study, researchers reported how machine learning methods can be used to identify, count and describe animals in the wild. Currently, scientists depend mainly on cameras in the wild to keep track of animals. But just like the first study, the second also points out the problems of trying to deal with the large amounts of information gathered. Processing this data can be costly and involve a lot of people. Researchers created a machine learning system they say uses artificial intelligence or AI to identify, count, and describe the behaviors of 48 animal species. They said their method can correctly identify animals at a rate of 94 percent. The scientists said results showed AI can be used as an effective way to gather “a wealth of information” on huge numbers of animals in the wild. They say the new methods will save time and costs, and can even operate in real-time. Bryan Lynn wrote this story for Learning English, based on a report from Sadie Witkowski of VOA News and other sources. George Grow was the editor.